This article is about the men's team. For the women's team, see Portugal women's national football team. The Portugal national football team (Portuguese: Seleção Portuguesa de Futebol, pronounced [sɨlɛˈsɐ̃w̃ puɾtuˈgezɐ dɨ futɨˈbɔl]) represents Portugal in international men's association football competition since 1921. It is controlled by the Portuguese Football Federation, the governing body for football in Portugal. Portugal's first participation in a major tournament finals was at the 1966 World Cup, saw a team featuring famed striker Eusébio finish in third place. The next two times Portugal qualified for the World Cup finals were in 1986 and 2002, going out in the first round both times. Portugal also made it to the semi-finals of the UEFA Euro 1984 final tournament, losing 3–2 after extra time to the hosts and eventual winners France. The team reached the semi-finals of Euro 2000, the 2006 World Cup and Euro 2012, as well as the final of Euro 2004, the latter on home soil. At Euro 2016, Portugal won its first ever major trophy, defeating hosts France 1–0 after extra time, with the winning goal scored by Eder. With the win, Portugal qualified and made its first appearance in the FIFA Confederations Cup held in Russia, where they finished third. The team's home stadium is the Estádio Nacional, in Oeiras, although most of their home games are frequently played in other stadiums across the country. The current head coach is Fernando Santos and the captain is Cristiano Ronaldo, who also holds the team record for most caps and for most goals. Portugal was not invited to the 1930 World Cup, which only featured a final stage and no qualification round. The team took part in the 1934 FIFA World Cup qualification, but failed to eliminate their Spanish opponents, aggregating two defeats in the two-legged round, with a 9–0 loss in Madrid and 2–1 loss in Lisbon for an aggregate score of 11–1. In the 1938 FIFA World Cup qualification, the Seleção played one game against Switzerland in a neutral ground, held in Milan, losing 2–1 against the Swiss, ending qualification prospects. Because of the international conflict due to the World War II, there was no World Cup held until the 1950 competition and subsequently, the national team made very few games against other teams. A 10–0 home friendly defeat against England, two years after the war, was the proof of how the irregularity of the games had taken its effects on the squad; this result still stands as their biggest ever defeat. On the restart of games, the team was to play a two-legged round against Spain, just like in the 1934 qualification. After a 5–1 defeat in Madrid, they managed to draw in the second game 2–2 and so the qualification ended with a 7–3 aggregate score. While they did not qualify on the pitch, they would later be invited to replace Turkey, which had withdrawn from participating; however, Portugal too refused to participate. 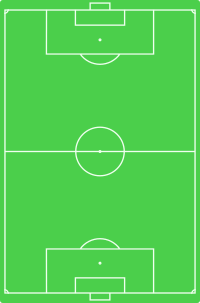 For the qualification of the 1954 World Cup, the team would play Austria. The Austrians won the first game with a 9–1 result. The best the national team could do was hold the team to a goalless draw in Lisbon, and the round ended with a 9–1 defeat. In the 1958 qualification, Portugal won a qualification match for the first time, 3–0 at home with Italy. Nevertheless, they finished last in the group stage that also featured Northern Ireland; only the first-placed team, Northern Ireland, would qualify. The year 1960 was the year that UEFA created the European Football Championship. The first edition was a knock-out tournament, the last four teams participating in final stage that only featured one leg while the older stages had two legs. For the first round, the Seleção das Quinas won 2–0 against East Germany and 3–2 in Porto for the second leg, finishing with a 5–2 two-legged win. The quarter-final opponent was Yugoslavia. Despite winning the first game 2–1, they lost the second leg 5–1 in Belgrade, and lost 6–3 on aggregate. England and Luxembourg were the 1962 FIFA World Cup qualification adversaries of the national team. Portugal ended second in the group, behind England. Like in the previous World Cup qualification, only the first in the group would qualify. In the 1964 European Championship. Portugal played against Bulgaria in the first round. The Portuguese lost in Sofia and won in Lisbon. With the round tied 4–4, a replay was needed in a neutral ground. In Rome, Portugal lost 1–0. In the 1966 World Cup qualification, Portugal was drawn into the same group as Czechoslovakia, Romania and Turkey. They topped the group with only one draw and one defeat during all the six games and finally qualified for a FIFA World Cup, that year the final stage would be held in England. Notable results were both 1–0 away wins against Czechoslovakia and Turkey and a 5–1 home win against the Turks. The team started out with three wins in the group stage where they were in Group C when they beat Hungary 3–1, Bulgaria 3–0, and two-time defending champions Brazil 3–1. Secondly, they beat surprise quarter-finalist North Korea 5–3, with Eusébio getting four markers to overturn a 3–0 deficit. Later, they reached the semi-finals where they were beaten by hosts England 2–1; in this game, Portugal would have played in Liverpool, but as England were the hosts, FIFA decided that the game should have been in London, which led the Portuguese team travel unexpectedly from Liverpool to London. Portugal then defeated the Soviet Union 2–1 in the third place match for their best World Cup finish to date. Eusébio was the top scorer of the World Cup with nine goals. In the Euro 1972 qualifiers, Portugal had to win its group that comprised the teams of Belgium, Denmark and Scotland. Portugal finished second to Belgium. For the 1974 qualification stages, Portugal were unable to defeat Bulgaria (2–2) in the decisive match, thus not qualifying. Portugal faced tough competition from the strong Poland team for the place in the 1978 World Cup in Argentina. They finished second place, behind Poland. The national team was put alongside Austria, Belgium, Norway and Scotland to fight for the first spot in the group, which would allow them to go to the final stage of UEFA Euro 1980. Portugal took third place. For the 1982 qualification, the Portuguese team had to face Israel, Northern Ireland, Scotland and Sweden for the top two group places. Portugal finished in fourth place. During the qualifying campaign for Euro 1984, Portugal was grouped with Finland, Poland and the Soviet Union. Portugal won the group with a win over the Soviet Union. Portugal ended in Group B, alongside Spain, West Germany and Romania. In the first two matches, they tied 0–0 and 1–1 against West Germany and Spain, respectively. A 1–0 win over Romania gave them second place in the group, to go through to the knockout stage, where they were matched against the hosts, France. The game was tied after 90 minutes and went into extra time; Portugal made the score 2–1, but France scored in the 114th and 119th minutes to eliminate Portugal 3–2 and go through to the final. For the 1986 tournament, the Seleção played against Czechoslovakia, Malta, Sweden and West Germany for the two spots that would guarantee them a ticket to Mexico. Needing a win in the last game against West Germany in Stuttgart, Portugal won the game to become the first team to beat West Germany at their home ground in an official match. The team exited early in the group stages after a win and two losses. They started with a 1–0 win to England, but later were beaten by Poland and Morocco 1–0 and 3–1 respectively. Their staying in Mexico was marked by the Saltillo Affair, where players refused to train in order to win more prizes from the Football Federation. 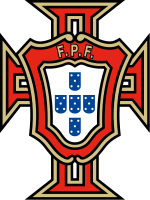 For the UEFA Euro 1988 the Portuguese team attempted to top their qualifying group in a group with Italy, Malta, Sweden and Switzerland; however, they finished in third. The 1990 World Cup qualification was in a group along with Belgium, Czechoslovakia, Luxembourg and Switzerland, Portugal fought to get one of the first two spots of the group. Playing at home against Czechoslovakia, the game ended in a 0–0 allowing the East Europeans to get the second place. During the draws for the Euro 1992 qualifying, the Netherlands, Greece, Finland and Malta were the other teams. The Portuguese ended second behind the Dutch. For the 1994 World Cup qualification, Portugal played in the same group as Estonia, Italy, Malta, Scotland and Switzerland for the two highest places. They ended in third behind Italy and Switzerland. At the UEFA Euro 1996, Portugal finished first in Group D, and in the quarter-finals, they lost 1–0 to the Czech Republic. This team was known as the Golden generation, a group of youngsters who had won the FIFA U-20 World Cup in 1989 and 1991 and were now leading the national senior squad; they also reached the semi-finals of UEFA Euro 2000 but were eliminated at the group stages of the 2002 FIFA World Cup despite high reputations. Portugal lost the Euro 2004 final 1–0 to Greece. Portugal failed to qualify for the 1998 FIFA World Cup. In Euro 2000 qualifying, Portugal finished second in their group, one point short of first-placed Romania. However, after finishing as the top runner-up nation in qualifying, Portugal nonetheless secured passage to the tournament final stage. In the final stage, they defeated England 3–2, Romania 1–0 and Germany 3–0 to finish first in Group A, then defeated Turkey in the quarter-finals. In the semi-final against France, Portugal were eliminated in extra time when Zinedine Zidane converted a penalty. Referee Günter Benkö awarded the spot kick for a handball after Abel Xavier blocked a shot. Xavier, Nuno Gomes and Paulo Bento were all given lengthy suspensions for subsequently shoving the referee. The final result was 2–1. During 2002 FIFA World Cup qualifying, Portugal won the group. Several problems and poor judgement decisions occurred during the preparation and tournament itself – shopping sprees by players were widely reported in the Portuguese press. Questionable managing choices and some amateurism, including the same lack of agreement on prizes. Portugal underachieved and ended third in its group stage, subsequently eliminated. Manager António Oliveira was fired after the World Cup. Portugal entered the tournament as favourites to win Group D. However, they were upset 3–2 by the United States. They then rebounded with a 4–0 smashing of Poland. Needing a draw to advance, they lost the final group game to hosts South Korea. Ronaldo, pictured playing against Germany at Euro 2012, assumed the captaincy in the wake of Euro 2008. The next major competition, the UEFA Euro 2004, was held in Portugal. On the preparation, the Football Federation made a contract with Luiz Felipe Scolari to manage the team until the tournament ended. The Portuguese team entered the tournament being a favourite to win it. The host nation lost the first game against Greece 1–2. They got their first win against Russia 2–0 and also beat Spain 1–0. They went on to play against England, in a 2–2 draw that went into penalties, with Portugal winning. Portugal beat the Netherlands 2–1 in the semi-final. They were beaten by Greece 1–0 in the final. After the tournament ended, a lot of players belonging to the Geração de Ouro (Golden Generation), abandoned their international footballing careers, with only Luís Figo remaining in the team, despite a temporary retirement. The silver lining for Portugal was the emergence of Cristiano Ronaldo. Ronaldo was selected in the UEFA Euro All Stars Team. While Portugal was playing in the competition, Scolari agreed in a new two-year deal with the Federation. Portugal finished first in the qualifying round for the 2006 World Cup. Portugal finished first place in Group D of the World Cup, with victories over Angola (1–0), Iran (2–0) and Mexico (2–1). The Netherlands lost to Portugal 1–0 in the Round of 16 in Nuremberg in an acrimonious match marked by 16 yellow cards, with four players sent off. (See the Battle of Nuremberg.) Portugal drew 0–0 after extra-time with England, but won 3–1 on penalties to reach their first World Cup semi-final since 1966. Portugal lost 1–0 against France in the semi-finals. Portugal faced Germany in the third place play-off match in a 3–1 defeat. Ultimately, the team won the "Most Entertaining Team" award for their play during the World Cup. Once again Scolari was asked to accept a new deal with the Federation that would maintain with as the manager until the end of the next competition. For Euro 2008 Portugal finished second in qualification behind Poland, and won their first two group games against Turkey and the Czech Republic, although a loss to co-hosts Switzerland set up a quarter-final matchup with Germany which the team lost 2–3. After the tournament, Scolari left to take over at Chelsea. Portugal came second in the qualifying stages for the 2010 FIFA World Cup under Carlos Queiroz, then beat Bosnia and Herzegovina in a play-off, thereby reaching every tournament in the decade. A 19-match undefeated streak, in which the team conceded only three goals, ended with a loss to eventual champions Spain in the round of 16, 1–0. Queiroz was later criticised for setting up his team in an overly cautious way. After the World Cup, squad regulars Simão, Paulo Ferreira, Miguel and Tiago all retired from international football. Queiroz was banned from coaching the national team for one month after he tried to block a doping test to the team while preparing for the World Cup, as well as directing insulting words to the testers. In consequence, he received a further six-month suspension. Several media outbursts from Queiroz against the heads of the Portuguese Football Federation followed, which partly prompted his dismissal. Paulo Bento was appointed as his replacement at head coach. Bento's team qualified for Euro 2012, They were drawn with Germany, Denmark and the Netherlands in a widely-speculated "group of death". They lost their first game 0–1 to Germany, then beat Denmark 3–2. The final group stage match was against the Netherlands. After Van der Vaart had given the Dutch a 1–0 lead, Ronaldo netted twice to ensure a 2–1 victory. Portugal finished second in the group and qualified for the knockout phase. Portugal defeated the Czech Republic 1–0 in the quarter-finals with a header from Ronaldo. The semi-final match was against Spain. The game ended 0–0 and Portugal lost 4–2 on penalties. In 2014 FIFA World Cup qualifying, Portugal won 4–2 on aggregate in a play-off against Sweden with all four goals being scored by Ronaldo, and was drawn into Group G with the United States, Germany and Ghana. Their first match against the Germans was their worst-ever defeat in a World Cup, a 4–0 loss. They went on to draw 2–2 against the United States and won 2–1 against Ghana. However, the team were eliminated due to inferior goal difference to the Americans. Portugal began the Euro 2016 qualifiers with a 0–1 home defeat against Albania, which resulted in Bento being dismissed from his managerial post to be replaced by Fernando Santos in September 2014. Nevertheless, the team qualified and were placed in Group F alongside newcomers Iceland, Austria and Hungary; after drawing with all three they advanced into the knockout stage as the third-best third place team. Portugal beat Croatia 1–0 in the Round of 16 after a goal from Ricardo Quaresma in extra time, then defeated Poland 5–3 on penalties to reach the semi-finals. In the semi-finals they defeated Wales 2–0 in regulation time with goals from Ronaldo and Nani to reach the final at the Stade de France against hosts France. The early stages of the final saw Ronaldo limp off the pitch injured; substitute Eder scored the match's only goal in the 109th minute. Ronaldo won the Silver Boot, scoring three goals and creating three assists. Following their Euro 2016 victory, Portugal participated in the 2017 FIFA Confederations Cup, where they finished third. In the 2018 FIFA World Cup, Portugal were defeated by Uruguay in the last 16. Wikimedia Commons has media related to Portugal national football team kits. Portugal's home kits has alternated between burgundy and a more standard red over the years. The 2014 World Cup jersey was notable for featuring both burgundy and red as primary colors. Portugal's Nations League, qualifying, and friendly matches are broadcast by RTP. The following players were called up to the Portugal squad for the UEFA Euro 2020 qualifying fixtures against Ukraine and Serbia on 22 and 25 March 2019 respectively. Caps and goals are correct as of 25 March 2019 after the game against Serbia. The following players have also been called up to the Portugal squad within the last 12 months. Cristiano Ronaldo is Portugal's most capped player and all-time top scorer. Players in bold are still active for the national team. *Draws include knockout matches decided on penalty kicks. Darker color indicates win, normal color indicates lost. *Denotes draws include knockout matches decided on penalty kicks. ***Red border color indicates tournament was held on home soil. ^ Semi-final finishes not counted. ^ Though there was no third place playoff, UEFA decided in the 2012 edition to award the semi-final losers (Germany and Portugal) bronze medals for the first time. ^ "Portugal football team". The Mirror. ^ Warren, Dan (4 September 2002). "Portugal's golden goodbye". BBC Sport. Retrieved 16 October 2018. ^ "Uefa suspends Portuguese trio". BBC. 2 July 2000. ^ "Fifa suspends Pinto". BBC. 19 June 2002. ^ ":. : Deco: "Futebol direto não é o nosso jogo" – Jornal Record :.:". Record.xl.pt. Retrieved 20 June 2014. ^ ":. : Carlos Queiroz suspenso por um mês – Jornal Record :.:". Record.xl.pt. 18 August 2010. Retrieved 20 June 2014. ^ ":. : Processo disciplinar a Carlos Queiroz – Jornal Record :.:". Record.xl.pt. Retrieved 20 June 2014. ^ "abola.pt". abola.pt. 6 June 2014. Retrieved 20 June 2014. ^ Borzello, Joe (16 June 2014). "2014 FIFA World Cup: Germany dominates Portugal, 4–0". CBS Sports. Retrieved 16 June 2014. ^ "Portugal coach Paulo Bento leaves role after shock Albania defeat". BBC Sport. 11 September 2014. Retrieved 11 September 2014. ^ "Croatia vs Portugal Euro 2016 match report: Ricardo Quaresma's late strike settles dreadful encounter after a Cristiano Ronaldo rebound". 25 June 2016. ^ "Lewandowski finally gets off the mark, but Portugal beat Poland on penalties". 30 June 2016. ^ "Ronaldo breaks Welsh hearts and sends Portugal to Paris". 6 July 2016. ^ "Portugal 1 France 0". BBC Sport. 10 July 2016. Retrieved 11 July 2016. ^ "Cristiano Ronaldo's tears of sadness turn to joy on Portugal's greatest night". The Guardian. 10 July 2016. Retrieved 11 July 2016. ^ Lowe, Sid (30 June 2018). "Edinson Cavani sends Uruguay to World Cup last eight as Portugal bow out". The Guardian. Retrieved 30 June 2018. ^ "Fernando Santos convoca para Ucrânia e Sérvia" (in Portuguese). FPF. 15 March 2019. Retrieved 15 March 2019. ^ "Played for Portugal national team". Retrieved 16 June 2015. ^ "Portugal national football team goal scorers". Retrieved 25 March 2016. ^ "Germany 2006: The final ranking". FIFA. 9 July 2006. Retrieved 19 March 2018. ^ "2006 FIFA World Cup Germany ™ | Awards". FIFA. Retrieved 19 March 2018. ^ "Laureus Awards 2017: Bolt, Biles, Rosberg, Atherton & Leicester among winners". BBC Sport. 14 February 2017. Archived from the original on 8 June 2017. Retrieved 18 October 2017. ^ "Laureus World Team of the Year 2017 nominees". Laureus. Retrieved 24 October 2017. Wikimedia Commons has media related to Portugal men's national association football team.